We decided to depart from our annual tradition of spending Labour Day in Kerikeri and go a bit further north this year. Friday afternoon and Monday night flights to & from Samoa allowed us to maximise our time away. We spent months debating where to stay on the island – La Vasa was close to the airport, has fales on a beautiful beach and fantastic dive sights off nearby Manono Island; the southeast coast offers a range of resorts from backpacker to luxury with idyllic beaches, overwater bungalows and a short drive to To Sua Trench. 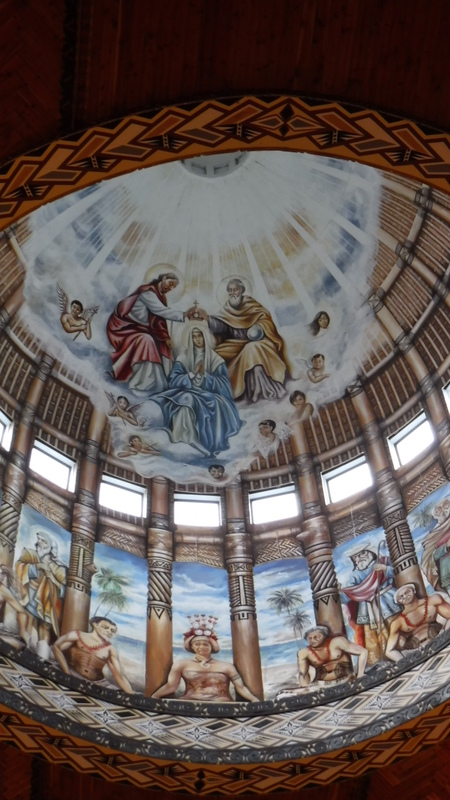 Ultimately, we decided to stay in the capital city of Apia. With such a short time on the island we did not want to deal with renting a car or being stranded at a resort (especially on Sunday when local buses shut down and cabs are hard to find). 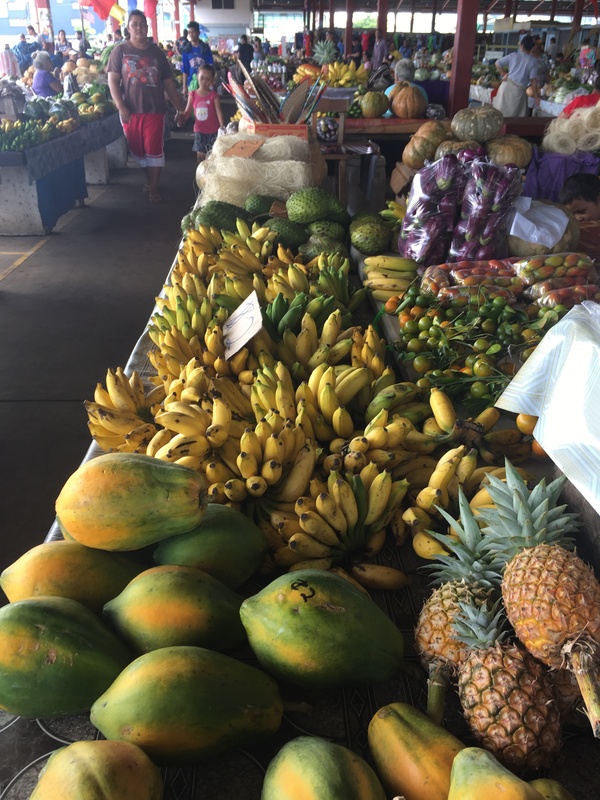 We were very happy with our decision since being in town allowed us to walk to the markets, church, Palolo Beach Marine Reserve and a selection of shops and restaurants. Since we were arriving after restaurants closed for the night I made arrangements with our hotel in advance to collect us from the airport and have dinner upon arrival. Unfortunately they forgot about us. We found our way to the hotel and went to bed hungry. The next day we moved around the corner to Aggie Grey’s Sheraton. 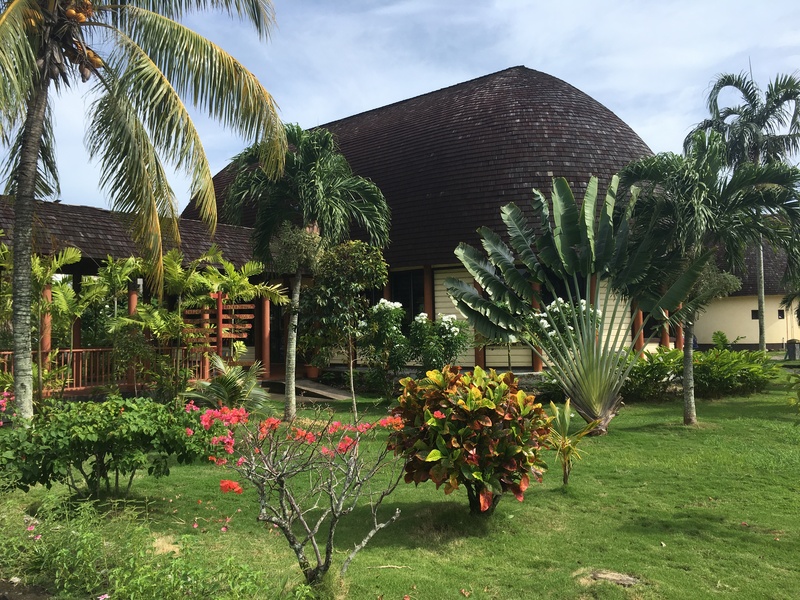 Rather than a cookie-cutter Sheraton, this has a distinct Polynesian feel with thatched roofs and open-air dining. The pools and swim up bar were a bonus too! On Saturday we walked around the town, visiting a couple open air markets. At the flea market’s food court nearly every vendor was selling fried chicken buns. We were converts after one bite. Sadly we weren’t able to find them again the rest of the trip. We were also happy to stumble upon All Things Sweet café, which serves the espresso-based coffee we’re used to. On Sunday we walked 10 minutes to church at the impressive Cathedral of the Immaculate Conception. Mass was said in English with some songs in Samoan. The colourful flower arrangements throughout the church, and leis presented to the priests and ministers were indicative of what we’d seen in the lush gardens around town. After mass we grabbed our snorkels and walked a kilometre to Palolo Deep Marine Reserve. Even in the shallow water close to shore it was only a few seconds before we saw fish. After swimming for about 10 minutes the reef drops off and we swam more freely without worrying about kicking any coral. Unfortunately, most of the coral has been bleached due to rising water temperatures, but an array of fish brings splashes of colour to the underwater world. On Monday we embarked on a full day tour of the eastern half of the island. From Apia we took Cross Island Road south, making stops along the way to take in the vistas, waterfalls, and houses of worship. 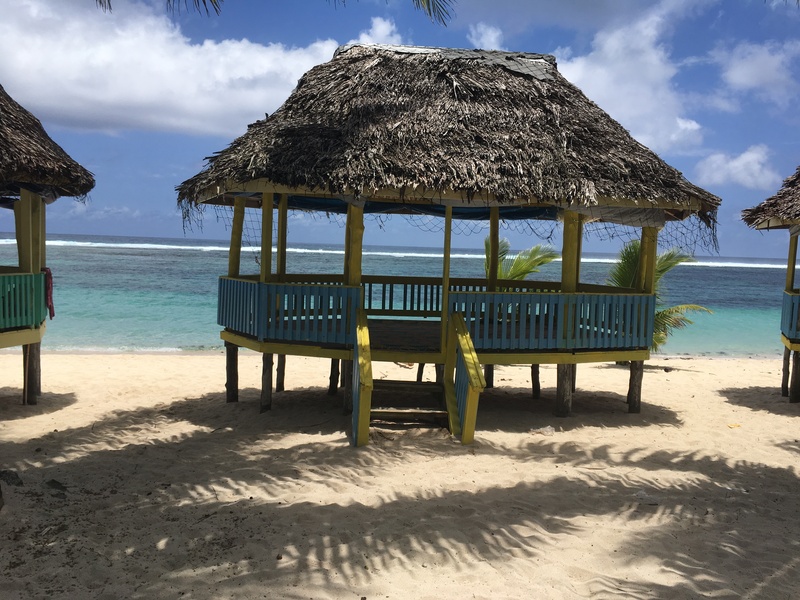 When we got to the south coast we popped into Sinalei Reef Resort for a look around and to admire their white sand beach. Traveling east along Main South Coast Road we took a dip in the cool fresh water at the two tiered Togitagiga Waterfall. Around noon we finally arrived at the stop I most looked forward to – To Sua Trench, arguably the world’s most stunning natural swimming pool. To Sua consists of two large holes, connected by a lava tube cave. One hole, the pool, connects to the ocean via an underwater cave. While you can’t see the waves, when you are floating in the turquoise water you feel the current pushing you back and forth. We could have happily spent the rest of the day at To Sua, but hunger eventually drove us up the 30-metre ladder and down the road to Lalomanu where we had lunch in a fale on the beach. After that I took a rest in the car as we turned north. Our last stop on the tour was the Piula Cave Pool, uniquely located underneath a theological college. After the tour we enjoyed a few hours poolside to enjoy the sun before heading to the airport for our 9:30pm nonstop flight back to Auckland. Tips for next time: I overheard a couple rave about their SCUBA dives off Manono Island; and visit the island of Savai’i. We’d booked Le Alaimoana for the weekend, but service was awful and we checked out after one night. Aggie Grey’s Sheraton Samoa (!) in Apia is beautiful with multiple pools including swim up pool bar. It’s also right in town.